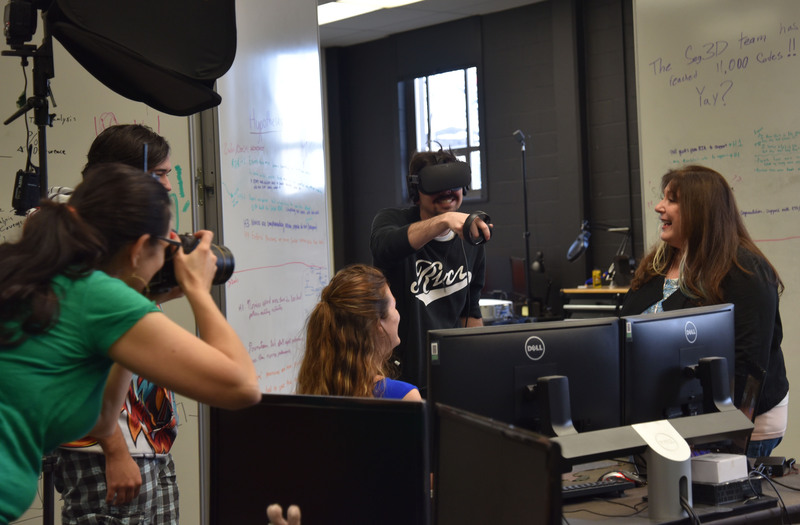 Director of Creative Services, Angilee Wilkerson, photographing Ruth West and xREZ Lab students. Pictured left to right: Ruth West, Meghan Kajihara, Luke Hillard, Brittany Taylor and Angilee Wilkerson. The Freshman Viewbook is a UNT marketing publication widely distributed at high school college day events and prospective students wanting more information about the academic and cultural makeup of the university. Ruth West and xREZ will be featured under the “Faculty Excellence” page to showcase the cutting-edge research coming to fruition under West’s direction. The current online Viewbook can be viewed at apply.unt.edu. Stay tuned for the June 2017 Viewbook! Max Parola demonstrates the Oculus Rift VR headset for UNT’s 2017 Viewbook. Pictured left to right: Angilee Wilkerson, Luke Hillard, Brittany Taylor, Max Parola and Ruth West.